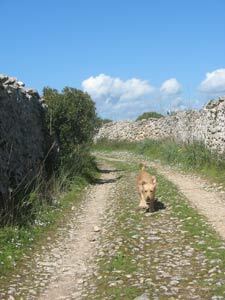 This walk is not difficult although the country lane does get a little uneven and stoney in places. Total of 4Km - 2.5 miles, Orange route an the map above. Starting at the Sant Climent end of 'Camino de na Forana' we follow this country lane, heading west along the tarmac section. 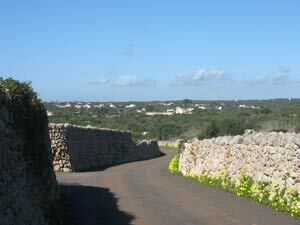 This first section of 1.2 miles/2 Km takes you through the menorcan countryside and onto the urbanisation of Binixiquer. 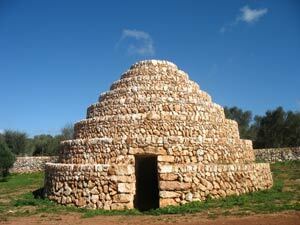 Passing through Binixiquer [0.3 Mile/ 0.5 Km] the lane narrows again and you pass a number of Menorcan fincas and casitas. A few hundred meters further and the tarmac ends, you are then on the old cobbled lane. The start of the urbanisation of Son Vitamins is just a further 0.5 mile/0.8 Km. 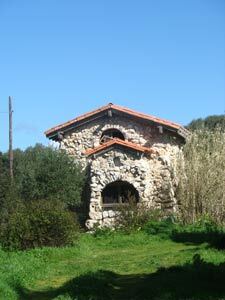 If wished you can extend the walk down to Calas Coves by following the sigh post at Son Vitamina. Good walking shoes, sun hat, sun cream, a bottle of water.